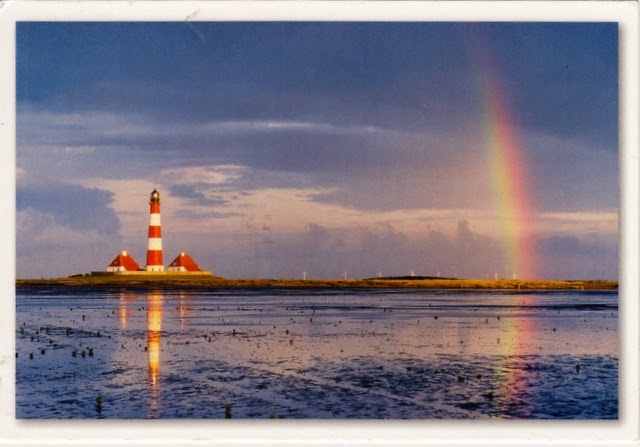 Postcard DE-3712774 from Germany shows a rainbow and the Lighthouse Westerheversand, located in Westerhever on the northwestern tip of the Eiderstedt Peninsula in Schleswig-Holstein, Germany. Surrounded by salt marshes, it is a major attraction on the peninsula for its 80,000 annual visitors. The 9-story lighthouse was built on a mound in 1906, with a focal height of 41 meters and a range of 21 nautical miles or 39 kilometers. It can be seen as far as 55 kilometers away in a clear day. 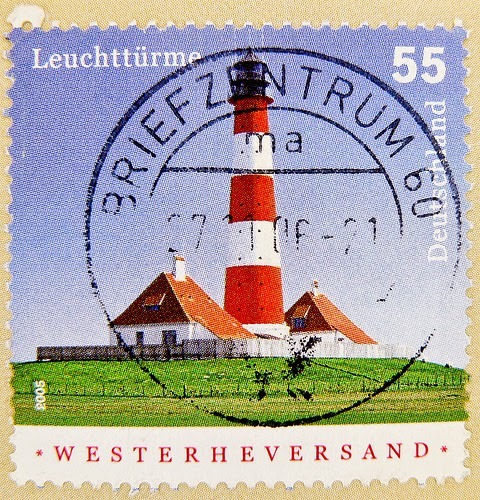 The lighthouse was featured on a 55-cent German commemorative stamp in 2005.